General Office Hours: 7:15 a.m. - 4:00 p.m. Monday through Friday, excluding state holidays. 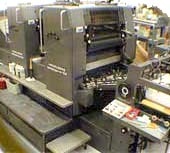 The Office of Production and Distribution is a full service, commercial grade print shop, distribution center and storage facility which is funded by the General Fund, and operates under the provisions of Sections 51-216a, 51-216b and 51-216c of the General Statutes of Connecticut. Located in Enfield, Connecticut within the G.A.13 courthouse building, the office provides a wide range of printing, binding, duplicating, mailing, document conversion and distribution services to Judicial Branch and other state offices. Publications and other services are sold to the legal community and the general public, at prices set by the Commission, under the provisions of the above statute sections. Full business office and accounts services are provided for our customers. We welcome your inquiries concerning our publications and services, and look forward to serving you in the future.